The Bamboo Room is a brand new restaurant part of the Hotel Nippon, specialising in Kerala Cuisine. While they didn’t really bedazzle us with their simple interior and menu, this is still a first look so perhaps in the future they’ll step their game up. The Nippon Hotel is back! 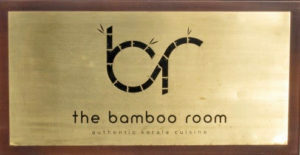 Our long-anticipated visit to the Bamboo Room finally took place after going there THRICE and finding the doors firmly closed with an ‘OPENING SOON’ sign smacked firmly in front. The restaurant is brand spanking new and when we went in at lunchtime we were told that the only items on the menu at that time were either rice and curry or biriyani.